Break out the violins and get your hankies ready, this is the story of a dinner for one. I found myself on my own the other night and without any dinner. There were no suitable leftovers, actually no leftovers at all because it’s getting to that time of the month where we find ourselves using up frozen treasures and store cupboard staples. So there I was, alone and hungry with very few options beyond a handful of frozen corn and some canned tomatoes. All by myself, don’t wanna be…Ok, that’s going a bit far. I did find a lone parsnip in the fridge, looking lonely and in need of some TLC, so I decided to make soup. Luckily, this was a supersized parsnip so it made just enough for one bowl of soup – although it was so delicious that I would have very much enjoyed some leftovers! Along with the parsnip, I had some thyme, some heavy cream and some blue cheese (this was the remains of the cambozola I used in my blue cheese burgers which had been wrapped in paper and kept in our cheese box and was still perfectly fresh a couple weeks on). 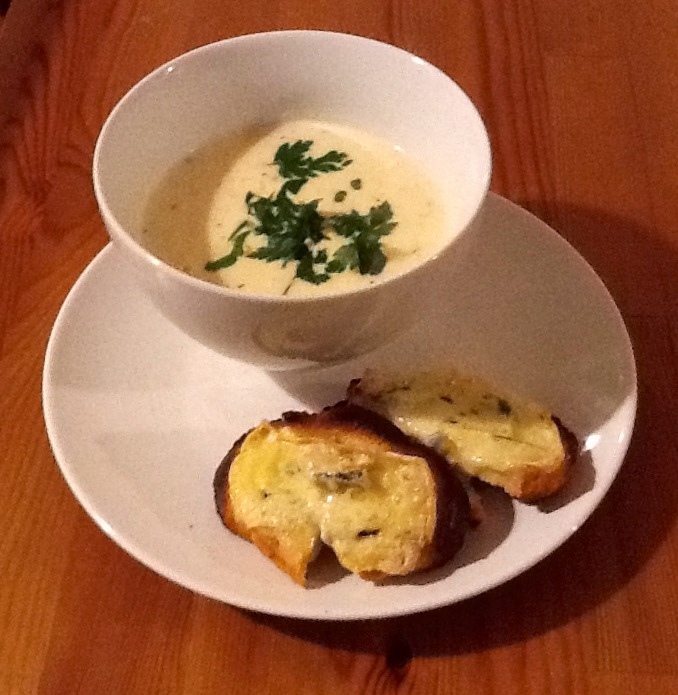 I also managed to fish out a couple of frozen nubbins of bread to make the blue cheese toasts to go with my soup. 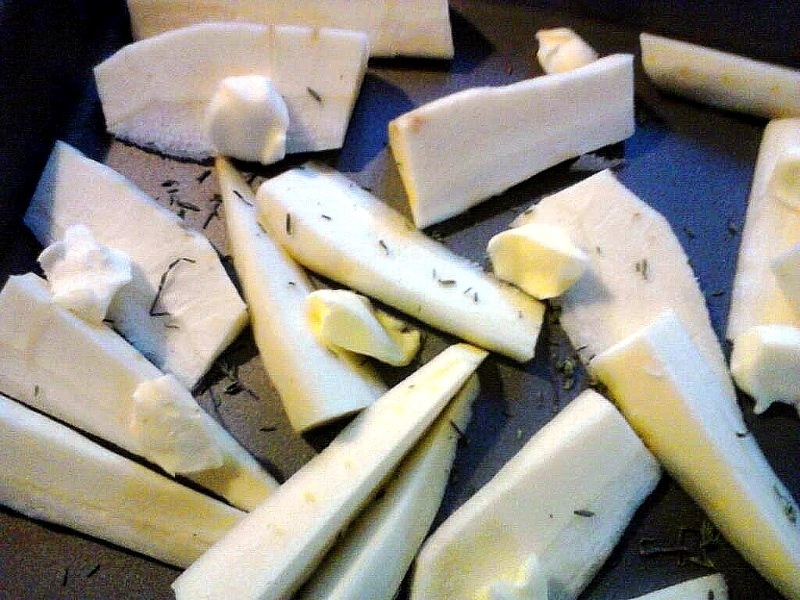 I started by roasting the parsnips with thyme and a quartered white onion in butter – dot the butter around the tray and after five minutes in the oven take the tray out and make sure all the vegetables are coated in the butter which will have melted. I roasted everything for about 20 minutes until it was all soft. Then I blitzed it in the food processor and added double cream until it was a bit soupier – you could use chicken stock or water, but I was being indulgent. Once it was smooth I poured it into a saucepan and reheated, adding a bit of water so it wasn’t quite as thick and rich. All it needed then was salt and white pepper and voila a piping hot bowl of soup which must have been one of my five-a-day, not to mention the calcium in all that cream! 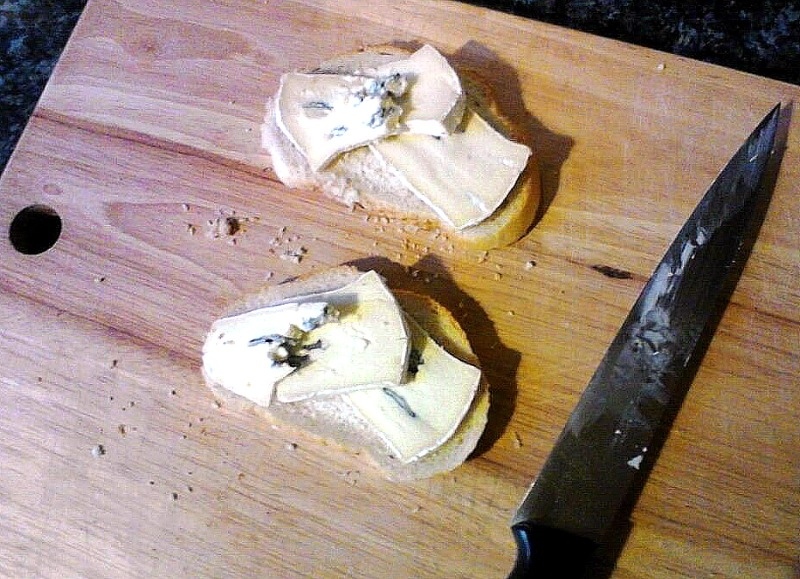 The blue cheese toasts were an additional luxury, but an economical one because they utilized two-week-old cheese and frost bitten bread. But once the bread was toasted, layered with thick slices of blue cheese and toasted again, it emerged from the oven bubbling and golden and there was no longer any doubt about its quality. Dipped in the velvety, slightly sweet parsnip soup it was heaven. This was an indulgent and luxurious dinner for one which was so good I was glad I didn’t have to share. Your dinner for one sounds so good…I think I will turn it into dinner for two. Contrary to my last sentence, I find it’s always better to have someone else showering you with praise about how lovely something tastes rather than having to tell yourself! I’ve never been into parsnip, but that soup sounds delicious. Thanks for sharing! Thanks! It was fabulous, but I love parsnips. Might’ve gone well with some Riesling! Haha. I was getting that impression! Thanks for visiting! Good thing your husband didn’t get par-snippy because there were no leftovers! Sounds delish! Nice simple soup. How can you go wrong with parsnips? Thanks for visiting my blog. Good luck with yours. Be careful. It is addicting. I’m already finding that! Thanks for following, look forward to reading more of your foodie adventures! Its definitely worth the 25 minutes it takes to make! Some people put the blue cheese in the soup, but I liked a more subtle blue cheese flavor so I could really taste the parsnip. Oh Yum! Looks and sounds divine! Parsnip and blue cheese. What a great combo. It really was, it was so luxuriously decadent. You’ve got to try it!